Clothdragon: Wednesday Update -No more nano! Wednesday Update -No more nano! It's done, and now I have failed my first non-nano daily writing task. And when I finally got home, I was cleaning the mess made when we pushed all our furniture around to create a make-do tv table (it wouldn't fit in our old cabinet and it was too tall to put it on top -- though that would have kept the peripherals safe). Since then I found that the wii is not working. We're going to send it in to Nintendo since I got it last year for Christmas and it should still be under warranty, but what we're really worried about is that Little Boy pushed something into the disk slot while he could reach it for now and they'll charge us anyway. We didn't see him do it, and we can't see anything in there, but I do worry. Oh well, we do use it a lot so I think we need it fixed if possible. All sorts of excitement going on here. So today I need to write two thousand words. A normal day for most nano-ers, but extending my deadline out a few months dropped me down to one thousand a day and that's where I was doing best until yesterday. Then I'm at the point in this story where I'm wondering if it can be a full size novel. My main character in this one has her eighteenth birthday in the first few days of the story, has just graduated high school, is trying to figure out what to do next with her life, and I'm wondering if I should be looking up that new category one of the publishers is talking about (if only I could remember where I read about it) that's not really YA, but one step beyond that. I wonder if the preferred word count for that genre as short as the YA that spawned it. I'm at thirty-five thousand words now, and I'm sure I'll need another fifteen thousand to finish it up, but I can't imagine getting sixty-five thousand words in there. Unless some other complication comes to me that needs to be worked in. Or this one may end up being nothing more than a nano exercise. But I have started an idea folder. Something about the daily writing does help spark the creativity to keep it going and I have to write down the ideas so they don't take over my brain or slip away -- and writing them down gives me the ability to put it aside for later while continuing my current project. Ah ah ah. (that's my evil laugh -- it does sound a lot like the Sesame Street vampire. I'll work on it.) Some writing discipline learned, even if I'm not excellent at it yet. Sorry to hear about the Celiac's! My Mom, Aunt and sister-in-law all have it. My sister-in-law in particular is a font of info. I'll see if she has suggestions on the dough. You can't go through Christmas without cookies! I wanted to say hello. 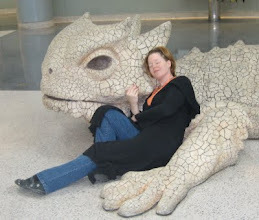 I noticed your "clothdragon" on the authoradvance website and loved the picture. Had to drop in and ask where is the real thing? Wow. Anyway, I'm following you. If you're interested, check out my blog at http://ronempress.blogspot.com and follow me. The current topic is not my norm. I'm really not violent. LOL Mostly I do blogs on Asian Fantasy settings and book reviews.